Short for Crew Interactive Mobile CompanioN, Cimon is a 3D-printed plastic sphere designed to test human-machine interaction in space. 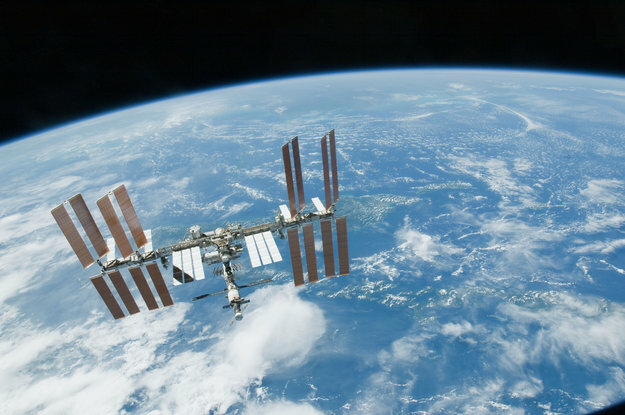 It was developed and built by Airbus in Friedrichshafen and Bremen, Germany, on behalf of German Space Agency DLR and uses artificial intelligence software by IBM Watson. Ludwig Maximilians University Clinic in Munich (LMU) is in charge of the project’s scientific aspects. 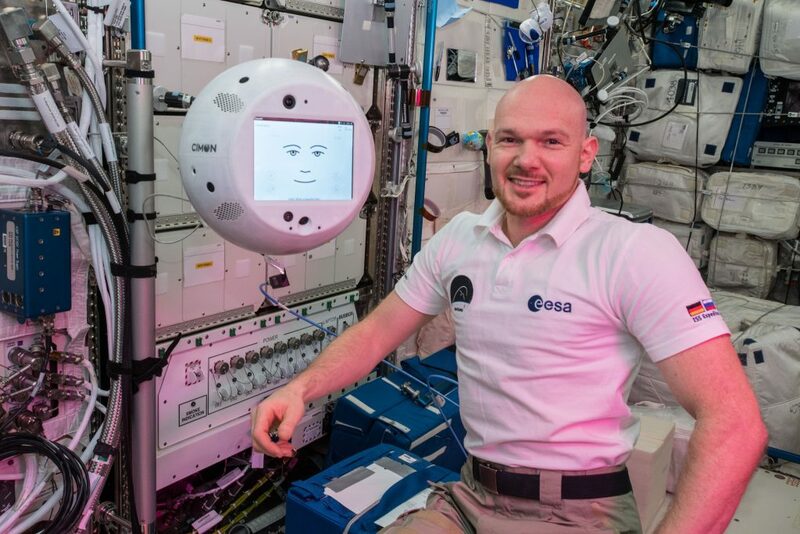 ESA astronaut Alexander Gerst with technology demonstration experiment Cimon. Image: ESA/NASA. Cimon weighs around 5kg and has a display screen at its centre. Its main aim is to support and increase astronaut efficiency by displaying and explaining information needed to carry out scientific experiments and repairs. Other applications include mobile photography and videography and the ability to document experiments, search for objects and maintain an inventory. Cimon can also see, hear and understand what it observes and is equipped with an autonomous navigation system, allowing Alexander to issue voice commands like you would to virtual assistants like Alexa, Siri or Cortana on the ground. During its first foray on Station, Cimon demonstrated its ability to look for and recognise Alexander’s face, take photos and video, issue instructions for a student experiment on crystal formation and show a clip about a magic cube. Upon request, it also played Alexander’s favourite song – a Kraftwerk one of course. Happy with this initial outing, both Cimon’s developers and Alexander hope to see Cimon back in action again soon. 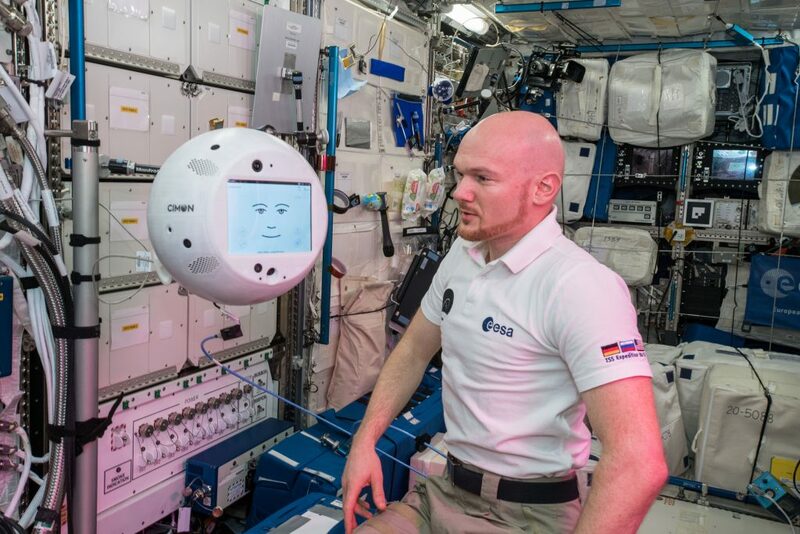 While no further sessions are planned during the Horizons mission for the time being, it could mark the beginning of exciting collaboration between astronauts, robotic assistants and possible future artificial intelligence in space. Wow, I need one of those in my office! This is such an amazing Experiment!! A childhoodhero becoming reality and alive! Ich would love to watch CIMON interacting with and talking to Alex. Who would want Siri or Alexa, If there is a CIMON!!! CIMON is really interesting.. I love watching him talking with Alex.. is there a video from the session available? Good luck CIMON, Hope to to see you soon in space again! Hi Alex, I also would be interested into the conversation you had with Cimon – what is the look and feel of an artificial intelligence interacting with you? Could you stretch it to see how much it “knows” or better how “intelligent” it really is at this time?